There is a place of light on earth where, every day, deep spiritual experiences are had, where miracles and healing occur. This place is called Lourdes and it is discovered tucked away in the foothills of the Pyrenees of Southern France where the landscape is composed of mountains, rivers and caves reaching deep into the earth. Here, profound faith and reverence fills the air and all are welcomed by a loving embrace. Here awaits a presence, a frequency, that can transform humankind or, at least, remind us of our true nature. 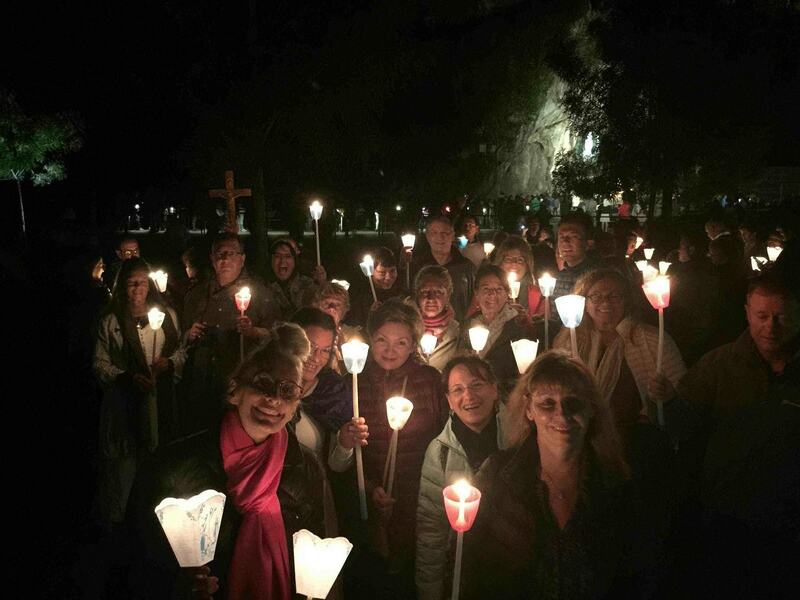 In October 2017, Clare and I led 34 beautiful souls, “pearls on Clare’s necklace,” on a healing journey to Lourdes and its Presence Beautiful, as I call it. This was my first visit. Clare first made a pilgrimage to Lourdes over a decade ago. She arrived in a wheel chair. She bathed in the waters. She drank the water. She believed. She left walking. Her story is one point of light in a sky of innumerable diamonds of Lourdes. Now, she shines brilliantly as the way shower on our journey. We arrived at Lourdes as humans. We left more than human, having touched the divine and having it touch us, deeply, profoundly, eternally. One doesn’t have to be a believer to experience this touch. One only has to have a heart and a mind open to the mysteries and Presence Beautiful of our divine cosmos. In a few words I hope to convey something of my experience with this Presence. 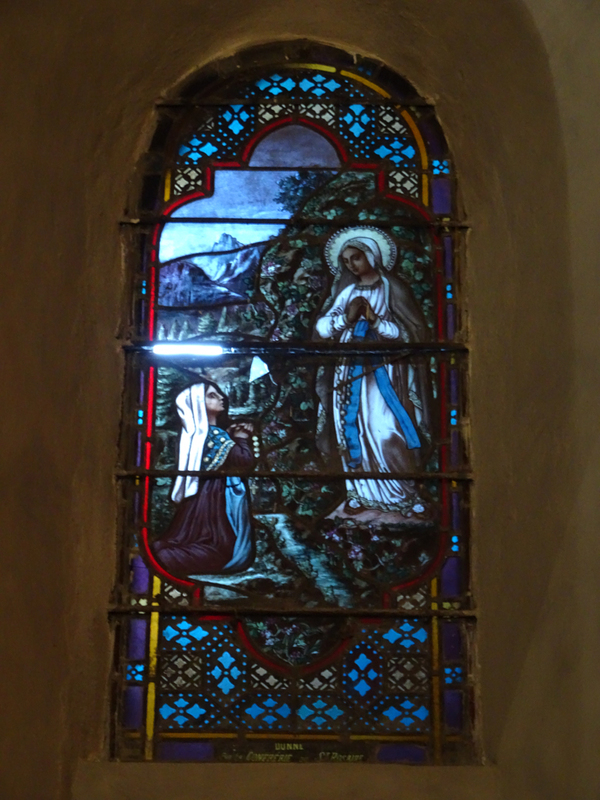 The Lourdes story began in 1858, when a glowing Lady in White appeared to an illiterate and nearly starving young girl named Bernadette Soubirous. Taking place in a darkened grotto in a rock wall under Massabielle these apparitions occurred 17 more times. Bernadette had no idea what she was experiencing (she said she was in an ecstatic trance state during her experiences) or that she was about to open a portal to a healing dimension. At first, Bernadette called the glowing being aquero, or “that thing”, since she didn’t know with whom, or with what, she was meeting. The girl was wearing a glowing white dress spun of some kind of shiny stuff. She wore a veil composed of the same fabric. She was beaming at Bernadette, smiling brightly, gleaming, resplendent with some otherworldly light. Later on, when Bernadette asked for the apparition’s name, the glistening being identified herself as “I am the Immaculate Conception”. With these words, thunder struck. Bernadette’s many naysayers and detractors, especially her Catholic persecutors, who practically tortured the young girl to recant her story, suddenly accepted her ‘fantasy’ visions as authentic. Not only that, but it kickstarted a massive effort by the Roman Catholic Church to approve the apparitions and to transform Lourdes into the single most important healing or pilgrimage site in the world. The reason why is that the concept of Immaculate Conception was only officially promulgated as church dogma in 1854. It is highly doubtful that an illiterate peasant girl from Lourdes would have known about the incredible mental gymnastics the Church fathers performed to declare the Virgin Mary free of the original sin of Adam and Eve and identify the radical concept by name. Bernadette and the apparition of Mary. As I learned of Bernadette’s story dots were connecting left and right to my work. 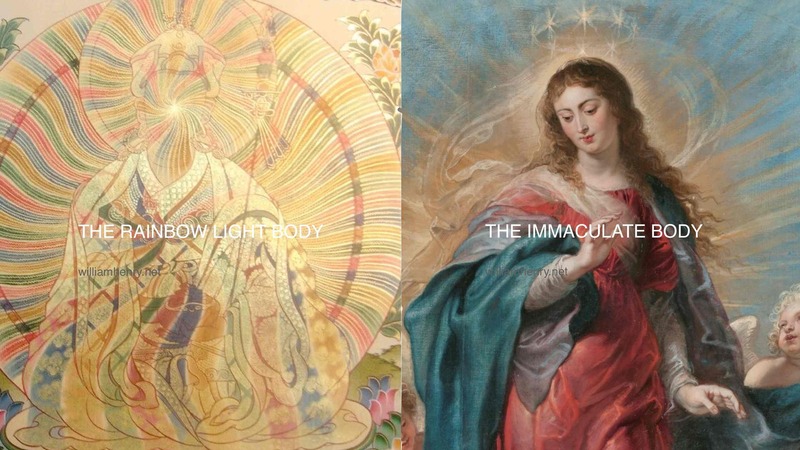 Mary shines because she is wearing the Robe of Light, Robe of Sanctity or the Beaming Garment of the Pure Ones or Perfect Ones who come from the Dimension of the Blessed and who populate ancient myth and sacred traditions. An inconceivably ancient order or tribe of beings, they love us beyond our comprehension and seek to heal our world. They live in the world of light we call dark (the other 99% of the universe we can’t see). When they manifest in our ‘dark’ world they can be detected by their presence and their glowing white robes. 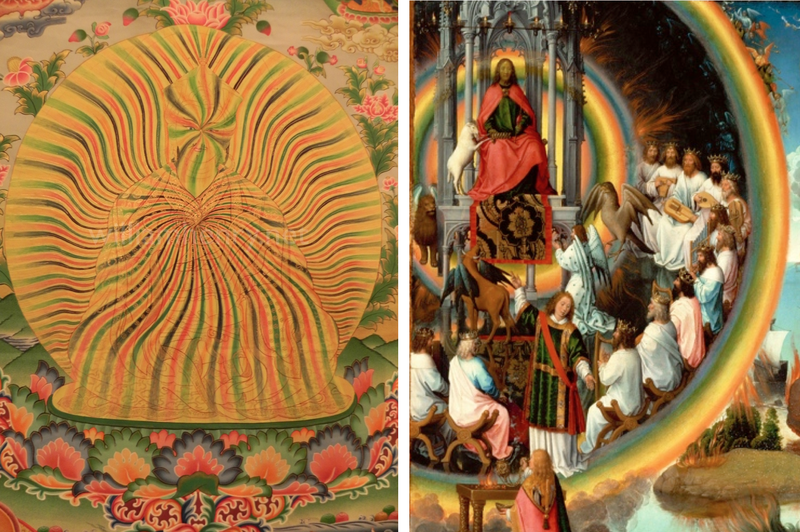 They and their holy garment has been the focal point of my research since 2002. Of course, when Bernadette told her family and neighbors about her experience no one believed her. Or so they said. For centuries before Bernadette’s time the Pyrenees have been home to legends of a White Lady who manifests in caves and grottoes and who travels from mountain top to mountain top in a flaming orb of light teaching a message of love, honor and compassion for our fellow humans. Mary’s interaction with Bernadette resulted in the manifestation of a miraculous spring of healing waters. The Virgin made three requests to Bernadette: drink and wash in the spring, build a chapel here, and invite the world to come in procession. Each year millions of people of all faiths and lands flock to this cosmic spring to drink and to bathe in its mystic slipstream. This water is infused with something carried over from another world and now has been carried the world over, followed by reports of spontaneous healing wrought by its power. During our stay at Lourdes we saw faces of every race, and people suffering from every malady, some beyond cruel, or even imagination, and many beyond modern medicine’s ability to explain or correct. Our hotel, I told our group, is actually a hospice for some. It is their last stop, their last chance. 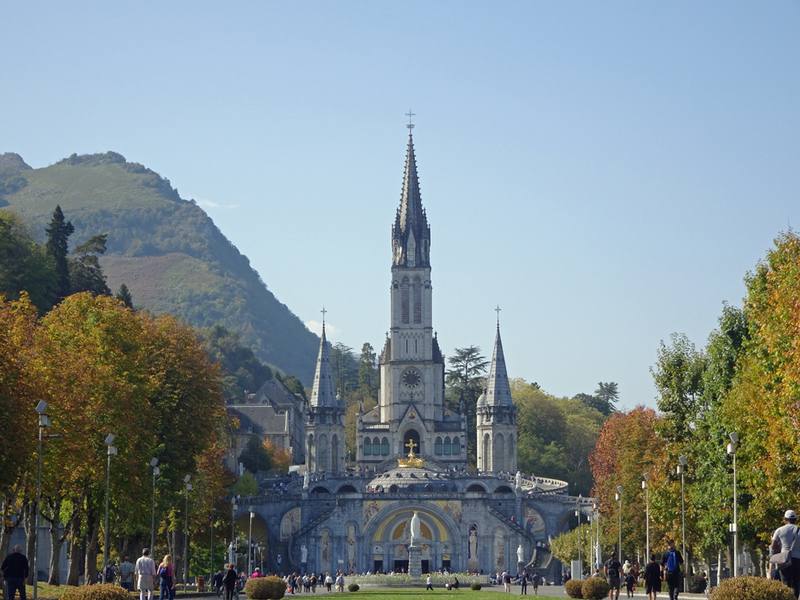 It is estimated that over 75,000 disabled visitors come to Lourdes each year. They are assisted by over 100,000 volunteers who come to assist them in all their needs and to facilitate their quest for a miracle. As with all great cosmic mysteries paradox abounds in these waters. All around us were thousands of people in need of deep healing, some suffering beyond human limits. But one does not detect any notes of sadness or pain in the air. Instead, it is joy and hope that one inhales, deeper than any other time in one’s life. The role of all who volunteer to come to this spring and are (seemingly) doing alright in body, mind and spirit is to support the healing, to affirm the power of faith and to answer the White Lady’s call to open our hearts and to heal our world with a flow of loving vibrations. In the middle of the Lourdes bubble is the basilica, its spires rising from the ground like antennae from a magic space ship. Mary offers a paradox of her own. She was a shimmering being of light who appeared to Bernadette in a dark cave. 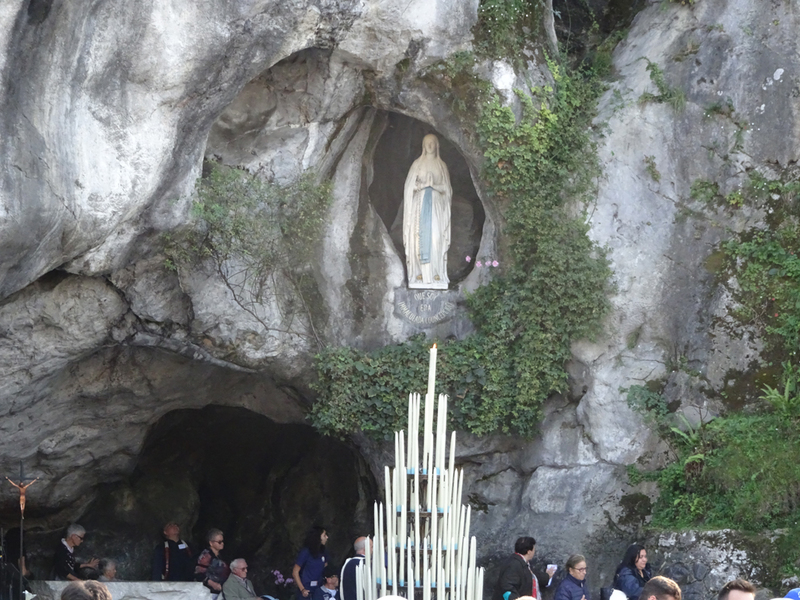 The grotto where Mary appeared to Bernadette is the focal point of Lourdes. Here, a miracle takes place each day as pilgrims gather like points of light from all over the globe. They drink the water as they wait in line to pray before a statue of Mary. Standing shoulder to shoulder, heart to heart, with other pilgrims who have made the same journey, many much further than our own, fosters a kind of human kinship that one wishes was the base frequency of the entire world. Statue of Mary in the grotto. Suddenly, all differences or divisions of race, gender, religion, nationalism or whatever vanish. All suddenly speak the same language of hope, belief…and miracles. We are ascending together. 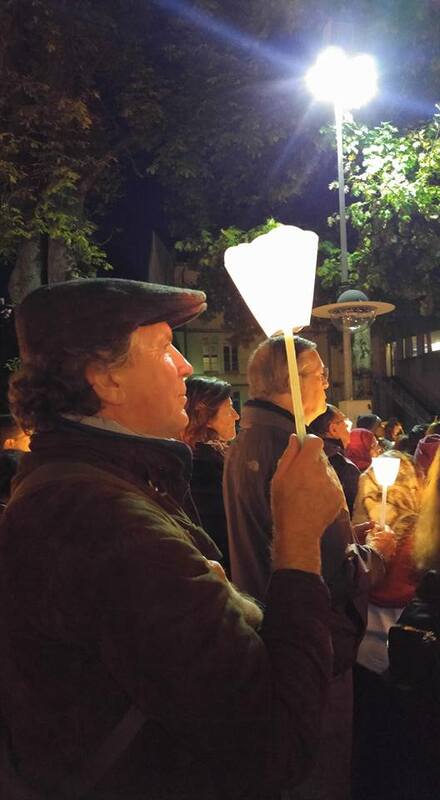 Beyond the grotto, the ultimate Lourdes experience is the candle light procession. At 9:00 pm each night thousands of people holding candles follow hundreds of people in wheel chairs at the head of the procession and wind down the street to the basilica. The site is awe inspiring. We processed together as pilgrims…as points of light in anticipation of joining with an indescribably higher light. We sang the Ava Maria…like the tune came from the stars or connected us to divine beings living in them. Earth’s purest ceremony, the Lourdes procession is like a scene from another world. it transcends religion because it is beyond belief. At the end of the procession an illuminated statue of Mary, standing on her Ark, greeted us all. The enormity of the spectacle is matched only by the wonder felt at, say, one’s first face to face encounter with the pyramids of Giza or standing face to face with the Shroud of Turin. It is so mind-blowing that one leaves the experience knowing less than when they arrived. Having led guests to both the pyramids and to the Shroud, Clare and I can attest that even without a miraculous healing this pilgrimage is spiritually significant as it compels, in fact it demands, one to look deeply inside (which is why we say our tours go beyond sight seeing). In looking within we seek wholeness, holiness and transcendence. We seek our Robes of Light. We find it all at Lourdes. 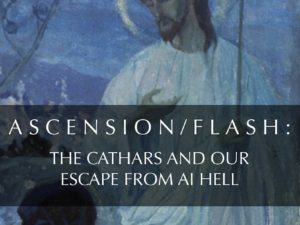 During the earlier part of our journey, I discussed how the Essenes believed that in order to enter the heavenly city, one is required to become like the angels who dress lightly in a white robe of glory. This is Mary’s robe. Attaining this robe of glory or robe of light required a transformation or perfection of her being (and, ultimately, our own) from earthly flesh to celestial flesh. The Essenes claimed to be experts in this transformation. Part of it had to do with the transference of cosmic waters into the waters of earth that occurred during the baptism of Jesus by the Essene master, John the Baptist. After his baptism, Jesus transfigured. Having been washed in the cosmic waters his face shone like the sun. A robe of light covered his flesh. In Revelation (22:14), John espouses Essene belief when he says, “Blessed are those who wash their robes, so that they will have the right to the tree of life and may enter” the New Jerusalem. Washing our robes was the main purpose of our pilgrimage. She got it!!! I thought to my self. In my work as a mythologist and the spiritual voice on ANCIENT ALIENS, I discuss appearances of ancient angels, aliens and avatars. As documented in art and literature, these are not flesh and blood beings. They are light beings. ALL of my understanding of the ancient alien ‘other world’ is necessary to comprehend the cosmic profundity of the mystery of ‘stargate Lourdes’. In the vernacular of extraterrestrial encounters Bernadette’s experience is a close encounter of the fourth and fifth kind: a bilateral, willing communication between a human and a cosmic being from another realm. My mythological specialty is human transformation into light beings. Everything I know about this subject is required to study the apparitions of Mary at Lourdes (and elsewhere). 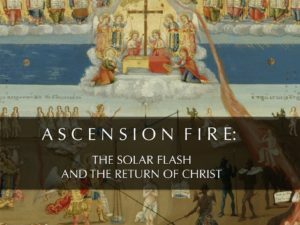 My research into the light body phenomena revealed that, as the first Christian to ascend, Mary is a cosmic being capable of producing miracles. 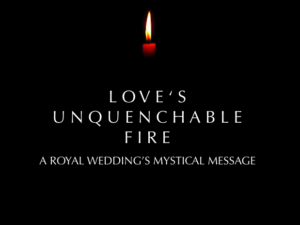 Having transmuted her physical body into light, Mary has attained the status of Perfect One. Stories of the Perfect Ones, especially from Tibet, tell how they infused rivers and whole valleys with the vibration of holiness. At Lourdes Mary created a place where humans can make contact with something profound, a force beyond our comprehension. In our talks I further discussed Mary as an Essene initiate who was one of many virgins whose genetics were altered by angels to bring forth a shift in human consciousness. According to the Dead Sea Scrolls, the Essenes alienated themselves from the rest of society to ‘perfect’ themselves in order to prepare and make way for the visitation of a high celestial being and to lead a revolution in human evolution by transforming themselves into angels and the earth into a planet of righteousness. After this next step in human evolution love would permeate the planet, understanding of and reverence for our cosmic selves would lift humanity to new levels of existence. The Essene ‘to do list’, called the Community Rule, tells us this high heavenly being, who many believe is Jesus, would reveal the Mysteries of Eternal Being…concealed from humankind. At that time the righteous will be rewarded with “healing, great peace in a long life, and fruitfulness, together with every everlasting blessing and eternal joy in life without end, a crown of glory and a garment of majesty in unending light (Community Rule 4:2-13). 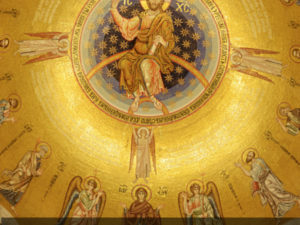 This teaching, referred to in the scrolls as the “Perfect Way”, “Perfection of Holiness, “Perfect Holiness” or “Walking in the Way of Perfection”, was given to the Essenes by these other worldly beings who are referred to as the Heavenly Holy Ones, Sons of Heaven, Holy Angels of the Lord or the Perfect Ones. My work is unique in that I am the first scholar of the Essenes to link their concept of the Perfect Body with the Perfect Light Body of Tibetan Buddhism. The Community Rule provides what I call the Essene to do list: get the crown of glory, the garment of majesty in unending light. Oh, and don’t forget the resurrection stick, too. Jesus holds the stick in resurrection images that match those of Padmasambhava. So it was that, following in the footsteps of the Essenes and the Cathars, we came to Lourdes to seek not just healing for our physical bodies, but also healing for our ethereal selves: the kind of healing that washes the robe of light, and puts us on the path of the crown of wisdom, and the wand of enlightenment that enables our perfection (attainment of wholesness and compassion) and ascension to the divine realms. It wasn’t until I got home and looked at my pictures that I found the crown. ONE DAY. ONE GIRL. ONE MIRACLE. Let’s face it. Our world seems like it is out of control. What can one person do to make a difference? For inspiration, we can turn to Bernadette Soubirous. Look at what this little girl’s experience has turned into. My sense is that we have only just began to comprehend what is possible at Lourdes. 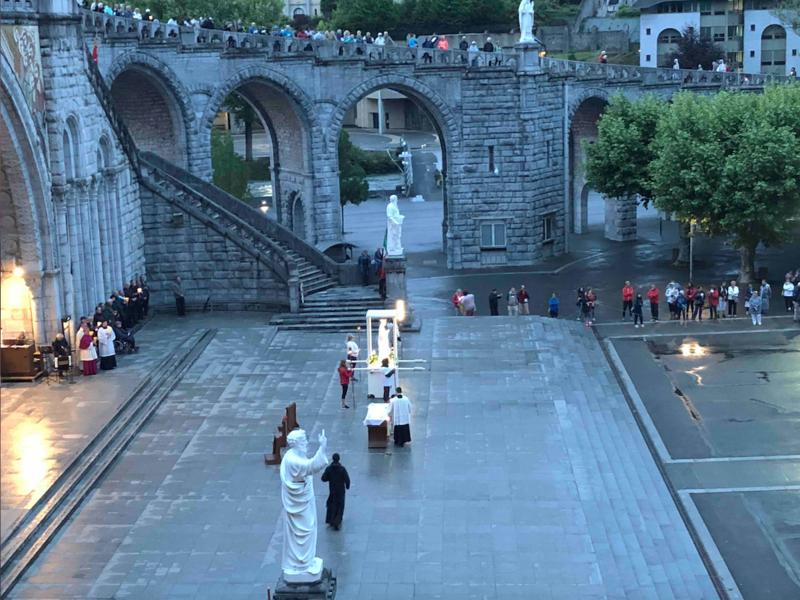 At Lourdes it is as if Mary blew a bubble from Dreamland that crossed over into our dimension and created a space for healing, love and unity of the human race via recognition of our common spiritual bond. You know it as soon as you arrive. You feel it. The place is special. A gift was given to humanity by this cosmic lady in white, a light being, an ancient alien. She gave us a gift more powerful than any advanced technology a flesh and blood alien could give us. Brighter than the sun. It shines in our world illuminating the waters of earth. With this light we can all wash our robes…and more. 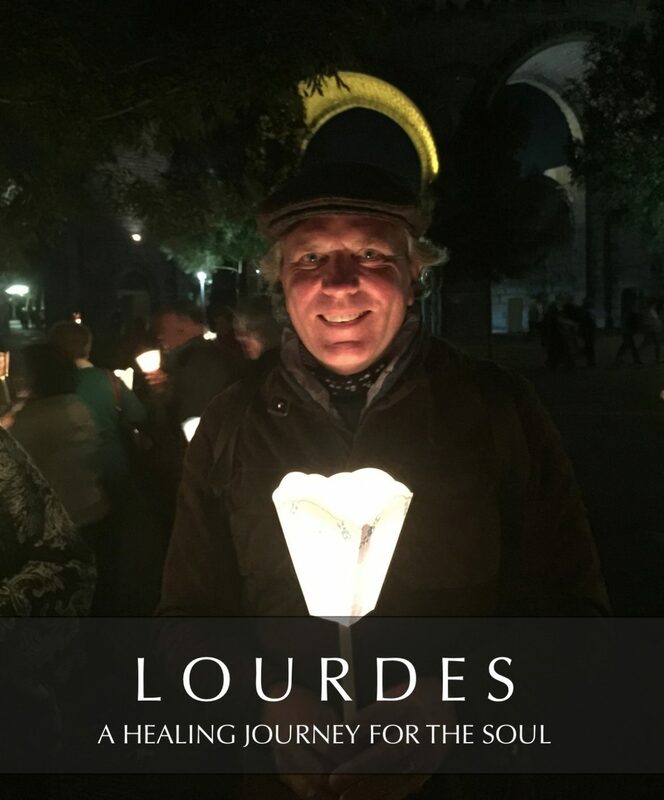 Clare and I will be leading another pilgrimage to Lourdes September 30-October 11, 2019. To request a tour brochure please visit here. William, this is a deeply moving, MAGNIFICENT/BEAUTIFUL ARTICLE. At times I could almost imagine being there.